August 23 – 26, 2018! Downtown Lake Orion comes alive during the Orion Art Center’s annual Dragon on the Lake Festival! We’re celebrating art, music, Dragon Boat Racing and a lot of fun, with an event for all ages. For over 35 years the Orion Art Center has worked to nurture artistic spirit, with classes, camps, scholarships, exhibits and special events. There are two things they love: infusing art into the community and connecting people with each other. Dragon on the Lake does both! The festival brings together dozens of organizations, hundreds of volunteers and thousands of participants. 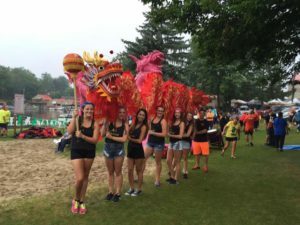 From Dragon Boat Races on Lake Orion, to loads of entertainment, there’s something for everyone. We also want to give special thanks to the people who make this festival possible – our sponsors, volunteers, and participants. They share our commitment to community and are vital to our success. If you’re someone who’s interested in getting involved, give us a call. We’d love to talk with you. Find out more about the Orion Art Center by visiting our website HERE or visit us inside our century old house near the Kidz Zone of Dragon on the Lake. Have a great time at the festival and enjoy your summer! Under The Radar! Michigan, visits Lake Orion and highlights the 2015 Dragon on the Lake. Take a look to find out more about our great festival.